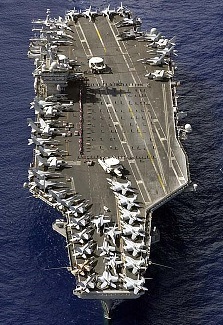 The US are moving naval forces into position for a possible strike against Syria. So it is a good time to remind ourselves just how much more striking power its aircraft carriers have compared to the rest of the world. In total there are 22 aircraft carriers in service around the world. This excludes amphibious assault ships, as although they might carry aircraft they have a different role, see more here. Of these 22 carriers in the world, the US operate 12.It would seem then that the US Navy has a little over 50% of the Worlds naval carrier strike power. But in fact the US superiority is even more than this. This is because US carriers are vastly superior in size and capability to any of the others ships. Therefore using the number of ships is misleading. We need to use different measurements. 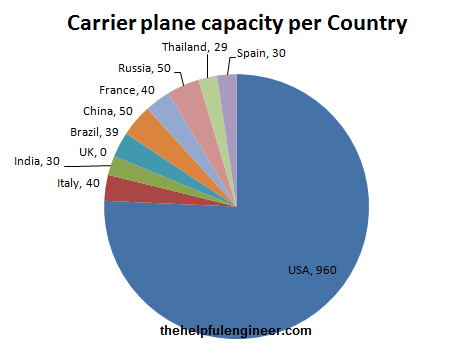 So based on the above, the US have approximately 76% of the Worlds carrier launched aircraft. This is an incredible superiority. Note: The UK have an aircraft carrier at present but they no longer have planes for it. Instead it is used to launch helicopters. 80% of the worlds total is an incredible superiority for one country to have in any area, but particularly with aircraft carriers. 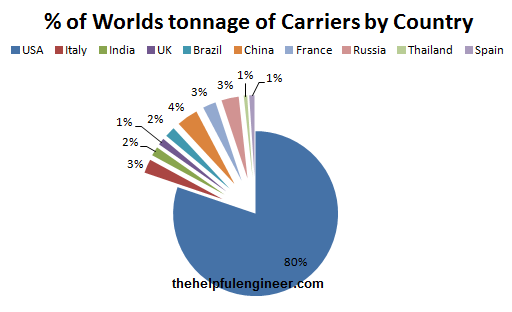 Put another way, the US Navy have 4 times more carriers, in tonnage terms, than all the countries in the world combined. The UK’s Royal Navy prior to World War one tried to maintain what it called the ‘two power standard’. This meant that the Royal Navy would always aim to have as many battleships as the combined total of the next two biggest navies. This was to try to ensure ensure victory if a war broke out. The US Navy seem to now have a ‘one power standard’ i.e. they are maintaining more aircraft carriers then the rest of the world combined. But despite of all this naval hardware, the advent of nuclear bombs/ missiles mean that the US is a lot less secure then the UK was when its navy ruled the waves. In the photograph below, taken in Norfolk in the US, there are nearly as many aircraft carriers in that one harbour as there are in the rest of the world combined (ex. US). UK’s QE aircraft carry is over budget, behind schedule and a waste of tax payer’s money. By 2018, who but USA is likely to goto War? Who is likely to invade the UK? Do we need strategic defense? Who are we defending? With the end of the Cold War, why does NATO still exists? Overwhelming superiority in Carriers permits US to fight small wars effectively. Big wars no longer depend on manned aircraft, but after World War II there has not been a big war anyway. The days of big wars are probably over.